Leading distributor, AWE, has now added cinema seating from UK specialist, FrontRow™, to its extensive range of products, brands and services for home technology integrators. Integrators can savour the FrontRow experience for themselves at the AWE show apartment in Epsom. Here, seating from the brand new Serenity collection features within the AWE KEF THX home cinema. A dual motor for independent control of seat, footrest and headrest ensures the seat can adapt easily to occupant size, posture and comfort requirements. Serenity is available in a wide choice of different fabric types and colours and can be easily scaled to fit the design of the room, from single seats to rows of 12. Integral USB charging ports are provided. 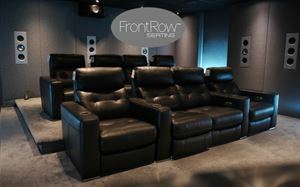 Installers can access the AWE home cinema, featuring the FrontRow seating, as a demonstration facility for clients. Prices start at £3,390 for a three seat option in a fabric finish, and £4,590 in high grade leather. For more details on the Serenity range from FrontRow, and to see the entire home cinema offering from AWE, please visit www.awe-europe.com call +44(0)1372 729 995 or email [email protected].